What is Lifemel honey? What is its connection to life? If linden honey is good for something, and acacia honey is good for something else, and echinacea honey is good for other something, how about if we would have a perfect honey, made from he most amazing flowers on this planet? Well, some people did thought of this and created a special place where they cultivated selected herbs, away from any reach of pesticides and pollution. And then brought a lot of hives filled with healthy working bees, ready to produce the best honey. And in addition, fed the bees with enriched food, including iron, protein and vitamins. Of course there is no such thing as the best honey, but considering the specific medicinal plants they cultivate there, the way bees are fed and taken care, it results a very good honey with high therapeutic properties. Those smart people are from Kiryat Shmona, Israel, and they created this honey at Zuf Globus Laboratories Ltd, after thirty years’ research. The honey they created is very good for preventing and treating the side-effects of chemotherapy and radiation suffered by cancer patients, and thus tremendously improving their quality of life. 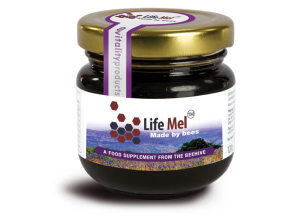 Lifemel honey contains medicinal herbs, such as: Siberian Ginseng, Echinacea, Uncaria and other plants, as well as natural bio-active materials, such as: iron, protein, enzymes and vitamins, which are needed for regularization of the immune system. The active ingredients in LifeMel are absorbed directly in the blood; they stimulate blood-cell production, increase the quantity of platelets and raise the level of hemoglobin. With the exception of preparing the bee-feed mixture, collecting the medicinal honey from the hive and packaging, there is no human contact in the production process, and no ingredients are added to LifeMel after the extraction of honey from the hive. The Chemical Analysis of the LifeMel reveals the following substances: Terpenoids,Eicosane, Fatty acids, 4-methyl cinnamic acid, Chlorophylls, Carotenoids, Fl6vonoids, Iron, Manganese, Molybdenum, Selenium, Zinc, Copper. One single small study was conducted in 2005, by Professor Jamal Ziden, head of the Oncology department in Sieff Hospital, Dr. Moshe Stein, Oncology department Rambam Hospital, and Professor Eitan Friedman of Sheba Medical Center. Name of the trial: Lifemel Honey During Adjuvant Chemotherapy for Breast Cancer Patients to Prevent Leucopenia The study included 60 patients, older than 18 years old, with early breast cancer, who were receiving adjuvant chemotherapy with AC (adriamycin- cyclophosphamide) or CAF (adriamycin- cyclophosphamide- 5- fluorouracil) combinations. Every day these patients received one spoon of Lifemel honey or regular honey (double blind)- during the adjuvant chemotherapy. Every week a WBC count was performed in order to record the influence of Lifemel on myelotoxicity. Life Mel Honey was effective in decreasing the incidence of anemia in 64% of the patients, decreasing the incidence of severe neutropenia and lowering the incidence of potentially fatal thrombocytopenia (low platelets). Medical Oncology, vol. 23, no. 4, 549-552, 2006. The results were conclusive: LifeMel is effective and safe and showed improvement in general feeling and quality of life. According to lifemelusa.com. Followig the same idea, feeding the bees with other specific plants, known to treat certain conditions, the company sells other types of honey like: RelaxMel, GastroMel, LadyMel, LadyMel Night, EnergyMel, BronchoMel, LaryngoMel. Two teaspoons of Life Mel honey a day, one in the morning on an empty stomach and one in the evening. The honey should be sucked slowly. • on Amazon, at a more reasonable price, here: 3 Packs Lifemel Chemo Support Unique Honey Support of Patients Suffering From the Side Effects of Chemotherapy and Radiation Treatment. While it is a very expensive product, 120 g of honey costs approx. $80 on lifemelusa.com, when our life is at stake, we realize money in itself is not that important. Nevertheless there have been reported a lot of bad reviews, people were not that satisfied with the results. But as usual, there were also very good reviews, as there are these ones, here. The scientific research available was done in 2005, only on female, over 18, all with breast cancer in phase 2, all taking certain chemo, and good results were in 64% of the patients. Since 2005, chemo has changed a lot. And there are also a lot of other cancer types which were not verified. Yet, if there is a slight chance to improve the life of our loved ones, let’s give it a try. I know I would. Hi I bought this for my dad after his first chemo put him in hospital, his second treatment still put him lifeless on the couch feeling weak ,so a week before his third chemo I started him on his honey he had his chemo and has been amazing pottering in his garden and just generally feeling amazing so going to visit him now is like going to visit my dad and not a stranger, it’s a small jar that lasts between 12/14 days priced at 37.50 a jar but It has been worth every penny to see my dad like this coz when he is feeling good so are we I highly recommend this product.